Top international tour operators have been enjoying an action-packed excursion of Mid and East Antrim as part of a visit to Northern Ireland. Tour operators from all over Europe, Ireland and even America, got their teeth stuck into Mid and East Antrim’s hidden gems, enjoying food, views and even immersive theatre experiences. The trip was part of Tourism Ireland and Tourism NI’s itinerary which brings international businesses to participate in the annual Meet the Buyer workshop in Belfast. 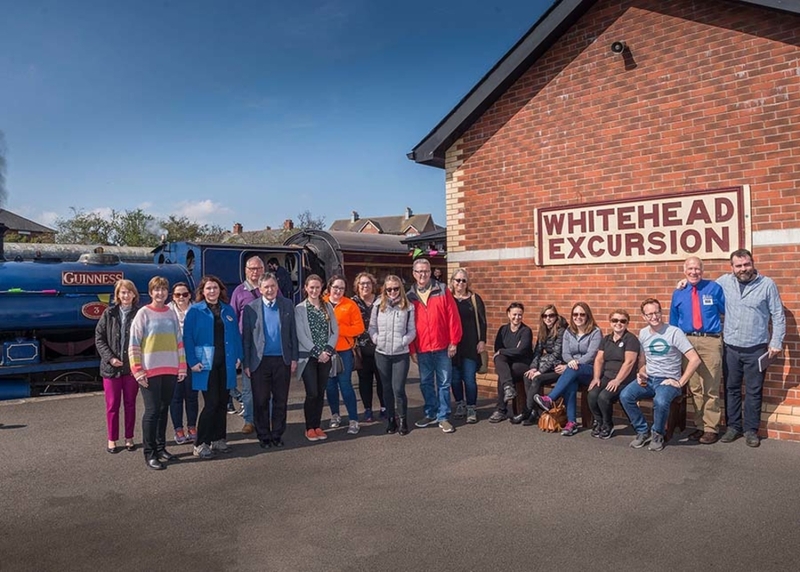 The group travelled along the Causeway Coastal Route, visiting the breath-taking Gobbins coastal path, Crosskeys Inn and The Bank House for some food and finally Whitehead Railway Museum where they enjoyed a ride on a steam train, with a theatrical twist. Performers from the Big Telly Theatre Company brought visitors back to Victorian times in epic style with a special preview performance of a series of plays they have coming up this summer. They told tales of smugglers, train robberies that actually happened in Whitehead, love letters and what it felt like to travel by train for the first time during the era. Niall Gibbons, CEO of Tourism Ireland, said: “Tourism Ireland was delighted to bring 147 top international tourism buyers to Northern Ireland for Meet the Buyer 2019 – including 39 buyers who are here for the first time – which provides such an important opportunity for our local tourism partners. The high attendance of these buyers from around the world is a strong indication that interest in visiting Northern Ireland remains high and that it can, and is, competing with the best destinations in the world. The series of bespoke participative theatre performances for all ages will unearth our rich industrial past in Flame! Gasworks Museum, Whitehead Railway Museum, Carnlough Harbour and Glenarm Village from 4 May as part of Industrial Heritage Month. Booking for these performances is essential, just search ‘Shaped by Industry, Shared with Pride’ on Eventbrite. All performances are free, however there will be an entry fee into Whitehead Railway Museum. For more information on any of the fantastic tourism sites across Mid and East Antrim, you can go to the Shaped by sea and stone website.